This year we celebrate our 20th anniversary as a JSE-listed company. 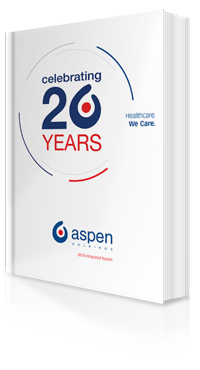 Established from humble beginnings in Durban, South Africa, and with a 160 year heritage, we have grown into a leading specialty and branded multinational pharmaceutical company. Our extensive basket of products treat a broad spectrum of acute and chronic conditions experienced through all stages of life. Our core categories that receive our highest focus include Regional Brands, Anaesthetics, Thrombosis, High Potency & Cytotoxics and Nutritionals. Our manufacturing facilities are scalable to demand and cover a wide variety of product types including injectables, oral solid dose, liquids, semi-solids, steriles, biologicals, active pharmaceutical ingredients and nutritionals. These facilities hold international approvals from some of the most stringent global regulatory agencies.